One of the true pleasures of Paris is the array of surprises that one stumbles upon when strolling the twisty-turny lanes through the City of Light. From medieval architecture to historic statues, and from stately fountains to tiny parks and green spaces, there’s something new and exciting practically around every corner. 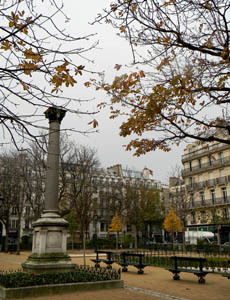 One such delight is the Square Emile Chautemps, located just off the very busy and very commercial Boulevard Sebastopol in the 3rd Arrondissement. Created in 1858 and dubbed the Square des Arts et Metiers, the park was later renamed to honor Emile Chautemps, a doctor, member of the French Parliament and leading supporter of the nation’s 1905 law formally separating church and state. 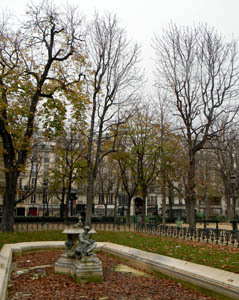 Just one-square block in size, the square includes two ornate reflecting pools (empty in the fall and winter) adorned with bronze sculptures by Charles Gumery and Auguste Ottin; a central column that commemorates the French victories during the Crimean War; a bust of Marc Seguin (the inventor of the wire-cable suspension bridge); a boules court; and several ping pong tables. 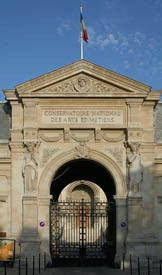 The placement of the Seguin bust is particularly appropriate, as the square overlooks much of the rear facade of the 18th century building housing the Musee des Arts et Metiers (Museum of Science and Industry) and the Converatoire Nationale des Arts et Metiers (a center of higher education dedicated to doctoral-level studies in science and industry). The park (Metro: Reamur-Sebastopol) is a popular lunch spot for the conservatory students, a surprisingly large number of whom engage in heated ping pong competitions when the weather permits. Other patrons include families with nearby apartments and older neighborhood gentlemen participating in boules matches. Notably missing are tourists, as the location is far from mainstream sight-seeing destinations. As such, travelers who venture to this charming green space are provided with a rare chance to see how “real Parisians” work and play. This entry was posted in Beauty of Paris, Parks and Squares, Right Bank and tagged 3rd Arrondissement, Boulevard Sebastopol, Conservatoire des Arts et Metiers, Musee des Arts et Metiers, Square Emile Chautemps by Bob Adams. Bookmark the permalink.